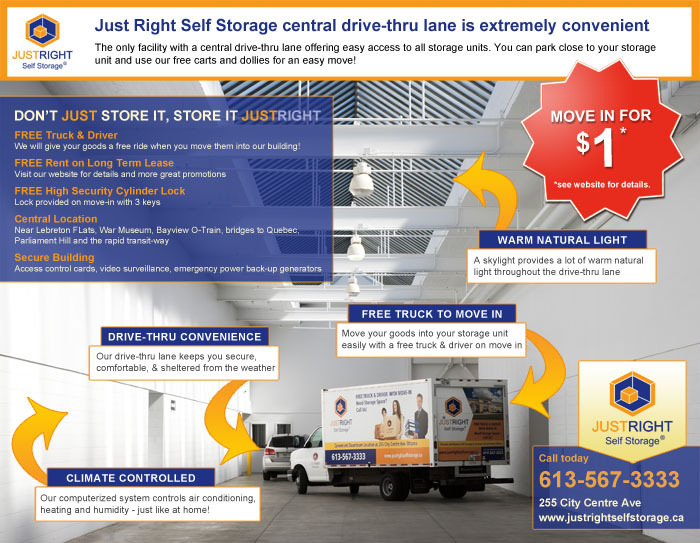 Drive through the facility, park close to your storage unit, and drive out when you are done! Our drive-thru lane keeps you secure, comfortable, and sheltered from the weather. A skylight provides lots of warm natural light throughout the drive-thru lane. You can park close to your storage unit on the first floor. Five large brand new elevators provide easy access to our second-storey units. We also provide free carts and dollies to make your move easy! 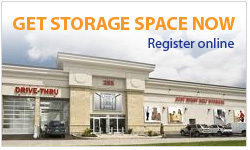 Looking for Storage Space in Ottawa? We offer a state-of-the-art secure storage facility with storage units of all different sizes to meet your needs. We have an interactive, online storage space calculator to help you determine which size of unit best meets your needs and you can also read more about our storage unit sizes to see the wide range of storage spaces available. Are You Moving in Ottawa? We have a fully stocked moving supply centre in Ottawa with everything from cardboard boxes to bubble wrap and packing tape. We are your one-stop shop for all of your moving and packing needs. A moving and packing supplies centre with everything you need to help you move!